Hi everyone!!! I am so excited to introduce you to a fairly new website called, All Things Lovely Daily Deals. If you haven't heard of them, you MUST go visit, follow, like and subscribe!! At All Things Lovely, you will find fun highly sought after products that are hand-picked and sold at discounted prices. Today, I am THRILLED and HONORED to share an item from Birch Baby Boutique that will be featured on their website this week for a steal! 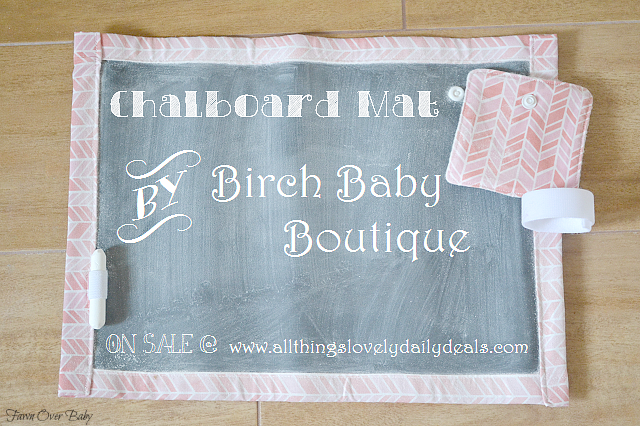 Be sure to visit All Things Lovely for more details about Birch Baby Boutique and their special offer! If you are a Pinterest fanatic, like myself, you have probably noticed that Chalkboards, Chalkboard Art and Fonts are a hot trend right now in home and party decor. Well how about we take the chalkboard fun on the road?! 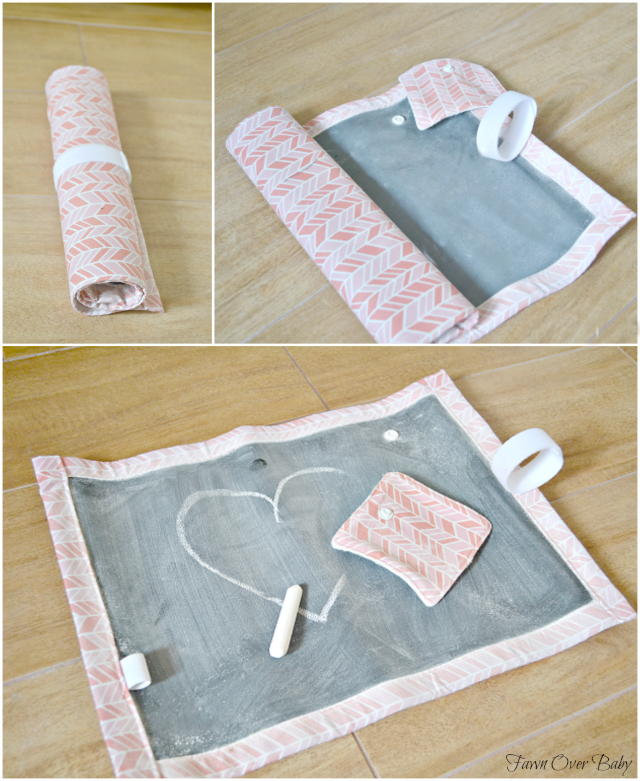 This portable Chalkboard Mat from Birch Baby Boutique is a wonderful way to entertain your little when you are out and about! 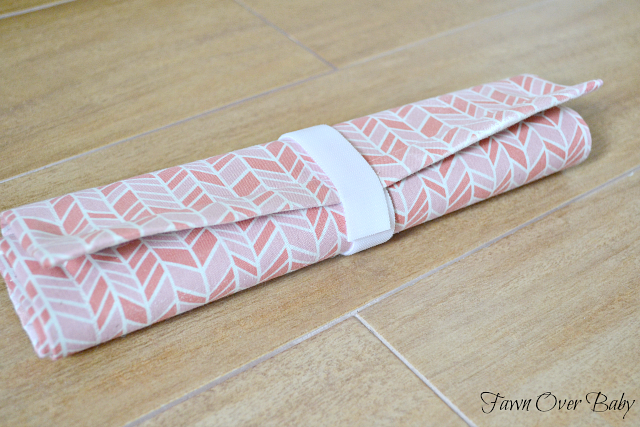 It has a roll up feature that allows for easy handling and storage in any backpack, travel or diaper bag. 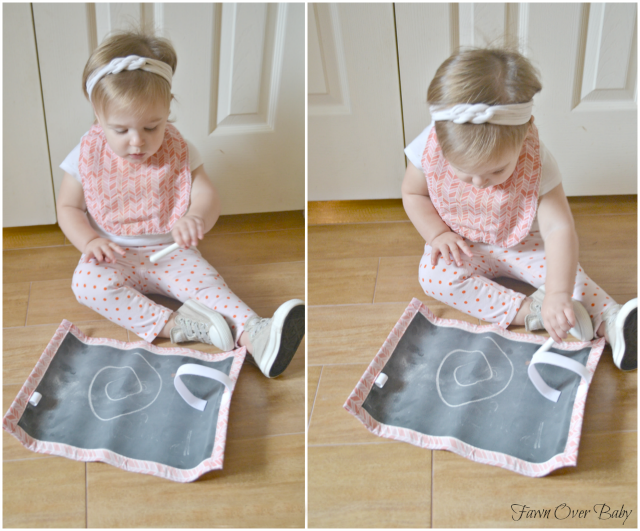 It comes equipped with an attached elastic velcro closure, as well as an attachable eraser and chalk holder allowing everything to stay in one place when not in use. .
McKenzie is now 13 months and is getting the hang of putting pen to paper. 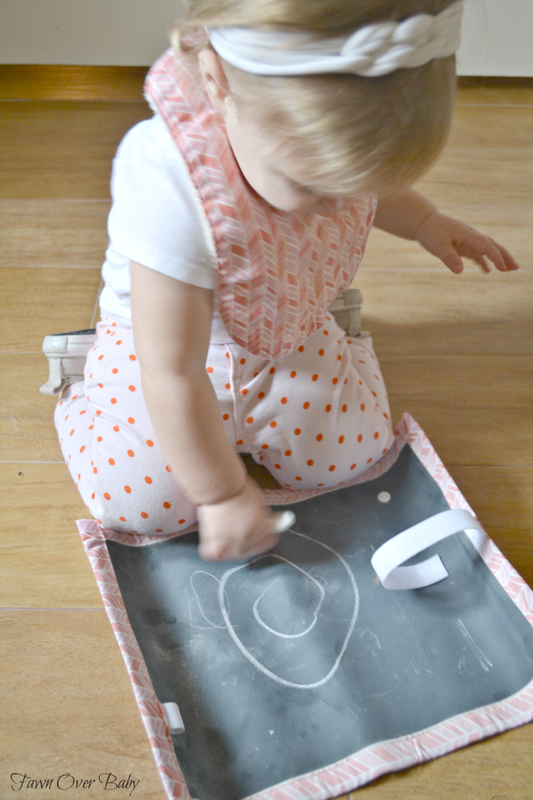 When we received this little dandy, I couldn't wait to introduce her to the wonderful world of chalkboard art! After I drew a few shapes, she followed my lead without hesitation and had so much fun marking dots and scribbles. With a long road-trip ahead of us next week, we will definitely have this handy for the car-ride and restaurant stops! 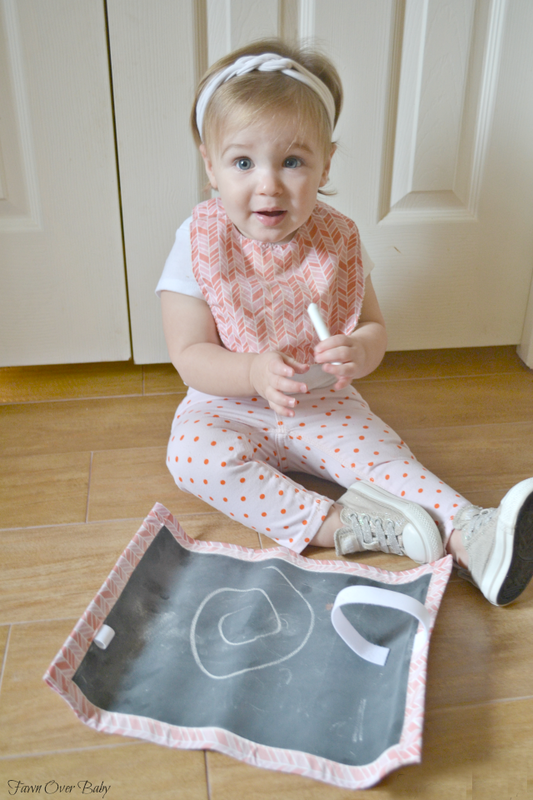 BBB also offers matching bibs and burp cloths! McKenzie is at the age where she is not particularly careful with anything she decides is a toy, so it's nice to be able to give her something that she can't break or tear up. These mats are soft, light weight, and extremely durable! Birch Baby Boutique offers a variety of colors and prints to suit your little girl or boy's style! Custom themes are also available upon request! With the holiday season upon us, be sure to take advantage of the great deal on All Things Lovely Daily Deals, as these would make for perfect stocking stuffers!! Thanks for tip on the cool website...I am in! What a neat little thing! Great to bring with you wherever baby goes!